The aim of our research is to further investigate the role of suffixes in morphological processing and to verify whether morphological series (i.e., paradigms of complex words sharing the same suffix) play a role in lexical representation and processing, as suggested by paradigm-based approaches (Bybee 1988, 1995; Booij 2010). 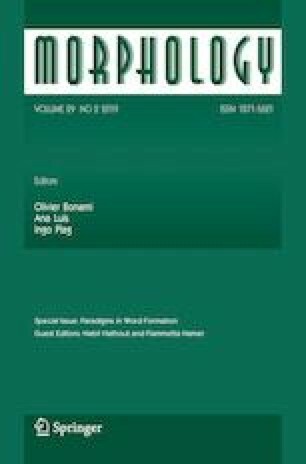 The premise of our study is that, while the relationship between words belonging to the same morphological family has been extensively confirmed by psycholinguistic research, experimental studies on the relationship between words belonging to the same morphological series have been scarce so far and produced inconsistent results. On such premises, we carried a series of masked priming experiments on Italian, which consider truly suffixed words with respect to words with non-morphological endings (it. inquina-mento ‘pollution’–cemento ‘cement’) and we focused on series which display different degrees of internal consistency. Crucially, in order to facilitate the emergence of the series effect, we used a semantic categorization task associated with the masked priming technique, instead of the traditional lexical decision (LDT). Our results show that when the masked priming effects are not inhibited by formal factors (as happens with LDT), the facilitation induced by the words organization in series emerges more easily, although it is affected by series consistency in different ways. Firstly, while the series effect approaches significance for consistent series, it fails to emerge for non-consistent ones (Exp. 1). Secondly, the base effect is more robust and clear-cut in consistent than in non-consistent series. Thirdly, in more consistent series the interference of formal/orthographic factors is absent or reduced, while it significantly affects processing in less consistent series (Exp. 2). All in all, our results demonstrate that the paradigmatic effects are inherently graded as they crucially depend on series internal consistency and that they crucially interact with family effects during word access. Authors’ contributions: S.D.M. conceived and designed the study with the support of H.G. for methodological aspects. S.D.M. created the materials, recruited the participants, conducted the experimental sessions, and wrote the first draft of the paper. H.G. ran the statistical analysis, contributed to results interpretation, and revised the paper critically for important intellectual content.